Surface Area: No project too small! Once this old deteriorated single ply roof rubber roof has been washed thoroughly and details resealed with appropriate and compatible butter grade sealants, it is ready for a new life. The silicone coating is far and away the most coast effective long term solution for single ply roofing restoration. The silicone coating is self cleaning with a good rainfall or a hose. As is the case with silicone bake ware, nothing sticks to silicone. 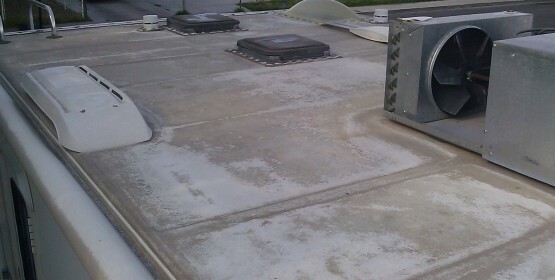 From pigeon droppings to tree sap and road grime, a good rainfall will clean this roof. 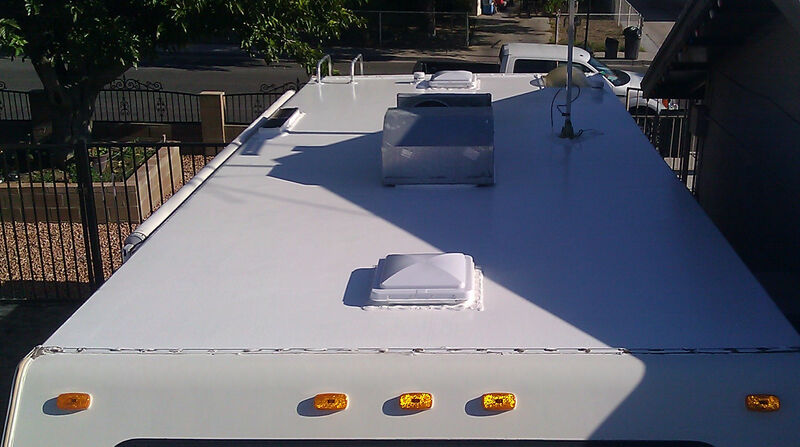 It has a solar reflective index of over 80% and will therefore reflect over 80% of radiant heat from transferring into this RV. Because it is fluid applied it is seamless and because it is not lesser, but available water based acrylic coating, it is also waterproof and wont wash away over a period of time.